Laura Del Villaggio, the visionary and talent behind Milli Starr, spent years studying costume and textiles at UT Austin and FIT in New York. At FIT, she was thrilled to learn they offered a Millinery Certificate program and spent the next two years devoted to learning hat-making. With each piece being meticulously hand crafted and original, one of their creations is the perfect way to stand out on your special day. 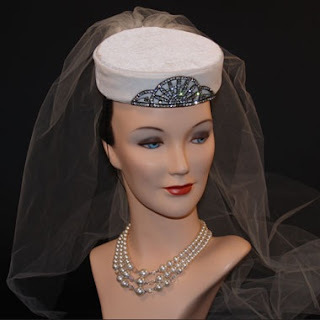 A beautiful Pillbox hat is the perfect way to add true vintage charm to your wedding day. 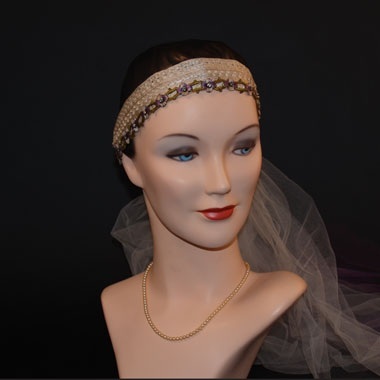 For the boho bride, the Greta headband with detachable veil is a sweet and simple way to combine a traditional veil, while still reflecting your style. Along with headpieces and hats, Milli Starr creates wonderful silk flowers with feathers and Swarovski crystals for smaller hair accessories. Prices range from $50 to $125 depending on your desired materials and bling factor. Being that the Kentucky Derby is *just* around the corner, you might want to order your perfect accessory now!